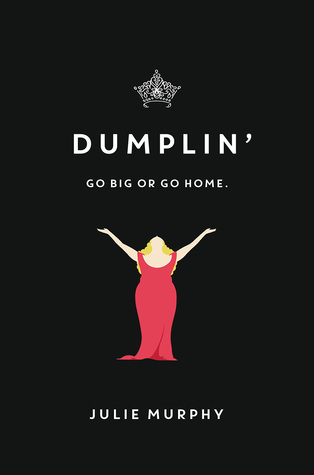 Presenting Dumplin' by Julie Murphy. Go big or go home. Dumplin' by Julie Murphy tells the story of the ever realistic self-proclaimed fat girl Willowdean Dickson as she battles the effervescent years of her teen life, Ex-beauty Queen mom, perfect figured classmates and her all-American best friend are things she knows how to handle but realizing that the guy she had the hots for likes her back, Now that makes her doubt. At the end of it its the ups and downs of everyday life and how our resident Dumplin' deals with her share. I'll be honest her, I kinda liked as well as hated Willowdean throughout the book. She is frank, confident, bold and very much at home in her fat physique. A no-nonsence girl who goes through like everyone else around her and has her own troubles to tackle. All the good points aside, she casts a rather intimidating personality. She is also pretty judgmental all things considered. She had a lot of abandonment issues, courtesy of her over-bearing mom but how she deals with that hurts everyone around her. I was expecting her to be bit more mature in the way she dealt with life and not be so belligerent but she had the capacity to make amends and learns from her mistakes so it wasn't all that bad but her attitude bothered me a lot. She was also so hard on herself. Her smoking hot co-worker Bo likes her back and she immediately starts doubting her worth and what people would say if they saw them together. I liked the romance a lot but hated the triangle. Its not right for Willowdean to keep stringing two guys around and hope no one finds out. While I liked that the romance didn't lord over the whole story but played a big part for 'Will' to start doubting herself but her daily life also played a part. Her mother and her best friend Ellen also played important roles. I loved that she was as normal and flawed as they come. Really irritated me a lot too bur at the end of it she deals with all the problems of self-confidence in body and mind and the sense of belonging and probable many other things that teens face all the time ..... Just her's come in a much much bigger shade is all. "A good coming of age story for everyone should read no matter their size"
I don't think a problem with self confidence is strictly limited to teens. I think we all suffer from a lack of it at times. I have this one on my shelf, I even started it, but it just wasn't the right time to read a realistic book for me. I'm into fantasy or anything else that takes me out of my world. Reality has been a bit harsh lately. I'm glad you eventually liked Willowdean. I love just saying her name. I think I'll enjoy this when I'm ready to read reality. I really loved this book. Glad that you enjoyed it as well. I agree that I expected a bit more maturity in how she dealt with the being overweight, but I feel it was done realistically. Great review!